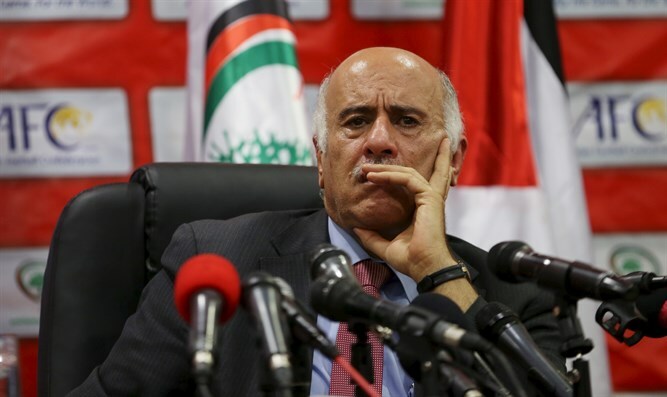 PA soccer chief Jibril Rajoub renews calls for FIFA to exclude Israel over games played in “settlements”. Palestinian soccer chief Jibril Rajoub on Monday renewed calls for FIFA to exclude Israel over games played in “settlements”, expressing disappointment at the world's body's recommendations. Rajoub, along with groups such as Human Rights Watch, have led efforts to have Israel suspended from FIFA or quit sponsoring Israeli matches in Judea and Samaria, claiming they are being held on “stolen land”. A FIFA commission chaired by South Africa's Tokyo Sexwale was created in 2015 to try to resolve the dispute. In March, Sexwale presented his recommendations to Palestinians and Israelis in a session described as "stormy". Rajoub, who was present at the meeting, explained the potential solutions proposed by Sexwale during a press conference on Monday. He said none of the three options offered by Sexwale met Palestinian expectations, adding he would "prefer that we go right away to sanction and to suspension (of the Israeli football federation)", though declared himself "realistic". "I appreciate and I respect what (FIFA) did", said Rajoub. The first recommendation proposes maintaining a status quo, which Rajoub said was in violation of international law. The second stresses that FIFA statutes ban any federation from organizing matches on a territory that is not its own, without the agreement of the federation of the country concerned. The third would be to seek a compromise, but efforts to do so have failed. "We were flexible, we were realistic but the other side insisted to act according to a policy of an expansionist, racist government," Rajoub said. Rajoub had previously campaigned to have Israel suspended from FIFA because, he claimed, Israel was restricting the movement of Palestinian Arab players. Culture and Sport Minister Miri Regev has criticized the Palestinian Authority for politicizing soccer. "Jibril Rajoub is trying to take advantage of FIFA for his political goals," she said during a meeting with Sexwale in November. "It is inconceivable that Rajoub, who is driven by political interests and personal ambitions, will use FIFA for political purposes and turn sport into a political issue," added Regev.